This 12 volt power awning can be used as a new installation or to convert your exisisting RV awning into an easy to use 12v power awning. Buy the Carefree Travel'r as a complete new awning, or upgrade your current Carefree or A&E patio awning. By upgrading your current patio awning you save hundreds of dollars. You keep you awning roller tube and fabric... simply change out the arms! The Travel'r arms incorporate some of the proven design features used on Carefree's popular 12V Eclipse. It features integrated styling and mounts flush to the RV to help the arms blend into the sidewall for great looks. The unique truss-support design provides superior strength and maximum head clearance for easy access to your patio area. The Travel'r also uses a wormgear motor for effortless operation and the peace-of-mind that the awning won't billow. Adjustable Pitch Model is ideal when you want the instant pitch adjustment not found on the flat pitch or steep pitch models. You decide which pitch is best for your needs at each campsite. Requires a flat mounting area of 67" x 3.5" from awning rail down. Flat pitch model is ideal for motorhomes, travel trailers or patio awnings (if upgrading) mounted over slideout rooms. This model also incorporates Carefree's exclusive Rain-Dump feature that automatically releases pooled water. 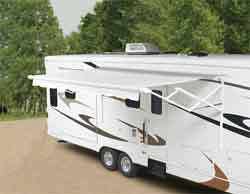 Steep pitch model for taller motorhomes and 5th wheels, where a steep pitch provides more shade. If mounting over an entrance door you must have at least 14.5" of clearance between top of door and awning rail.